We love to hear from our clients when they return from their Honeymoon or Romantic Getaway. 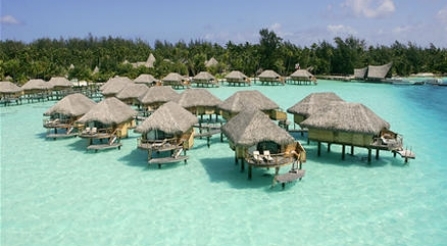 Read the latest review from clients returning from the Moorea Pearl Resort and the Bora Bora Pearl last month – April 2014. Hey Annie! Everything was great!! We really enjoyed the private photo shoot/boat tour in Bora Bora! Great guy, really enjoyable to be around and made it a special experience start to finish…we both HIGHLY recommend him if someone is interested in that. He said we were the first or one of first referred from you. Stephanie said it’d help to know ahead of time if locations have drinkable tap water or not. Both islands were great…did the 4×4 tour in Moorea and it was really fun too. 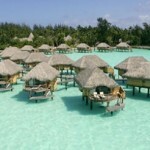 Bora Bora was amazing to see, almost unreal! Overall we loved every bit of it!! Thank you very much for everything!!! Oh, I forgot to mention that the boat tour in Moorea where we got to scuba and had lunch (not sure if you planned or we added) was also really great! Think the tour guide was Leke or Tiki or something like that, a local guy with dreadlocks. I’d suggest that one also! Remarkable Honeymoons stands ready to help you with every aspect of your Honeymoon or Romantic Getaway in French Polynesia. We are happy to arrange activities for you including private motu picnics, private boat photo tours, and snorkeling with sharks! Remarkable Honeymoons is proudly affiliated with World Travel in Portland, OR. Through this affiliation we are partnered with Virtuoso, a luxury travel consortium that ensures all of our clients receive the best of care. Call us (Toll free 1.866.614.1803) or request a quotation if we can be of assistance to you in the planning process. We enjoy what we do and look forward to the experience with you.